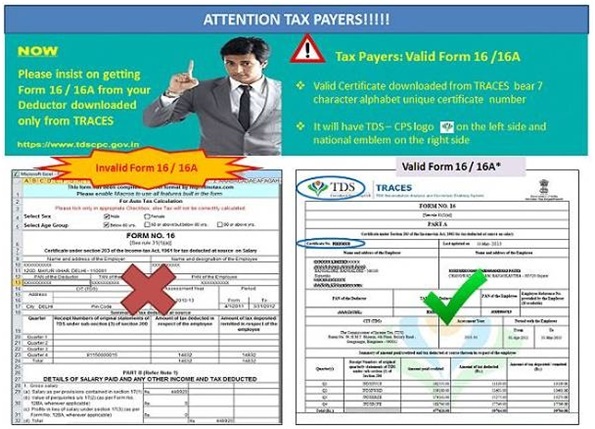 You should ensure that TDS certificates (Form 16/16A) issued to you are downloaded only from TRACES. You should ensure that TDS certificates (Form 16/16A) issued to you are downloaded only from TRACES (TDS Reconciliation Analysis and Correction Enabling System of the Income tax department). Certificates downloaded from TRACES are in a specific format. A form downloaded from TRACES would bear a 7 character alphabet unique certificate number and it will also have a TDS- CPS logo on the left side and a national emble on the right side at the top. This certificate would provide the details of the income paid to you and also the tax deducted from that income by the payer and whether the same has beden deposited by him with the government. See below for a sample of how a valid TDS certificate in Form 16 or Form 16A should look. 2. Digital signature should be verified. Your name, PAN, Deductor's TAN, amount paid to you, TDS amount should be correctly reflected on the TDS certificate. You can verify whether your TDS -as shown in the TDS certificate received from the deductor --has actually been received by the government or not by comparing with the Form 26AS. It is the duty of a taxpayer to verify whether the deductor has deducted tax on each transaction on which it was supposed to be deducted. He must also check that the TDS mentioned in form 16/16A is reflecting in Form 26AS. In case the TDS shown in your TDS certificate is not reflecting in your Form 26AS it would imply that although the deductor has deducted the tax on your behalf but the TDS has not been deposited / has not reached the income tax department. In case of any discrepancy between the TDS certificates and Form 26AS inform your deductor and ask for the reasons for this discrepancy and get it corrected. A possible reason behind the mismatch can be because your PAN has been incorrectly entered in the records of the deductor. In case the deductor has not deducted the tax on your behalf, then it is your responsibility to remind the deductor to deduct tax on your behalf and deposit the same with government. One can gather all information related to TDS in Form 26AS which is sufficient to file one's return. This might make you doubt the importance of TDS certificates but the rationale behind introducing Form 26AS is to enable the taxpayer to cross check the details mentioned in his/her TDS certificates with those mentioned in Form 26AS and create transparency. TDS certificates are important because because these certificates and the Form 26AS are a cross check for each other-in case there is a mismatch you can try to get the relevant document corrected. Without the TDS certificate you would not get to know if there was a mismatch.